While we have already seen quite a few new smart watches early this week, we might be soon seeing the Moto 360 smart watch as well. Lenovo, which now owns Motorola Mobility, has sent out press invites for an upcoming launch event on September 8 in Shanghai. 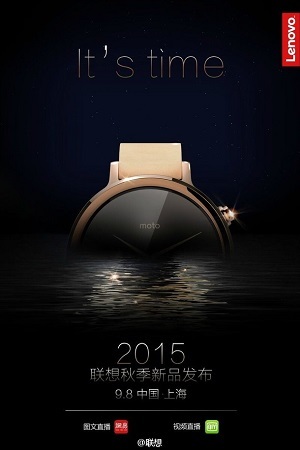 While the invite just says “It’s time”, it also teases a Moto branded smart watch, which would definitely be the next generation Moto 360. The watch also seems to showcase the much talked about flat tire design. According to rumours, the Moto 360 would be launched in two sized variants – one with a 1.37 inch display with a dial size of 38 mm and strap size of 20 mm and the other with a 1.55 inch display with a 46 mm dial and a 22 mm strap. Sources also suggest that there would be a Moto 360 Sport variant that would be available in black, white and orange.